Clear the Lane! 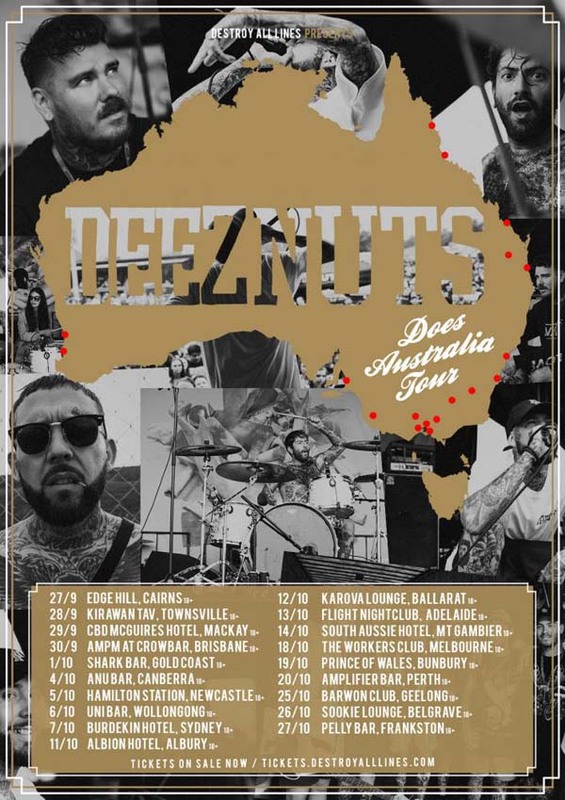 OG Heavy-Hitters Deez Nuts are hitting the road around Australia in September and October 2018 on the Deez Nuts Does Australia 2018 tour! Deez Nuts are currently tearing their way around the USA on the final ever Warped Tour and late last year saw them headline the Never Say Die Tour in Europe. This Australian tour takes the band to regional areas and capital cities around this fair land, stopping in at a whopping 19 locales over two months; Cairns, Townsville, Mackay, Brisbane, Gold Coast, Canberra, Newcastle, Wollongong, Sydney, Albury, Ballarat, Port Adelaide, Mt Gambier, Melbourne, Bunbury, Perth, Geelong, Belgrave and Frankston. Tickets on sale from Destroy All Lines.